Welcome to South Perth Bridge Club. South Perth Bridge Club is located at the corner of Barker Avenue and Brittain Street in Como. See our Contact page for a map of our location. The nearest major bus stops for Bus 910 along Canning Highway are Perth bound stop 10330 or Fremantle bound stop 10239. Bus 31 from the Esplanade Busport also stops at just outside the club. We run duplicate sessions every day, except Sunday and two evenings a week. There are sessions for players who wish to play in a regular session, a novice session or a supervised session for new players where assistance is available. Go to Sessions for more details. If you need to find a partner for a game at a regular or supervised session, please contact Dionne here and provide details of when you want to play, your skill level and basic system preferred. 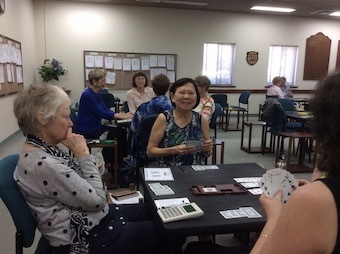 Lessons for beginners and improving players are conducted regularly throughout the year by professional teacher Fiske Warren at South Perth Bridge Club. Go to Lessons for more details. On behalf of the members and the management committee of the South Perth Bridge Club, we warmly welcome interstate, out of state and overseas visitors to come and enjoy a game at the club. Any enquiries can be made by phoning the club during session times on (08) 9450 1077.